If you have any questions or want to enquire about dates, use our form to contact Roberto & Maureen Scheda or see their website for more information. 500-year-old Casperia is a characterful, car-free maze of cobbled streets in the Sabine Hills. La Torretta, a long-time Sawday’s favourite, has the dreamiest views from its rooftop terrace, and easy interior spaces and furnishings designed by owner architect Roberto. 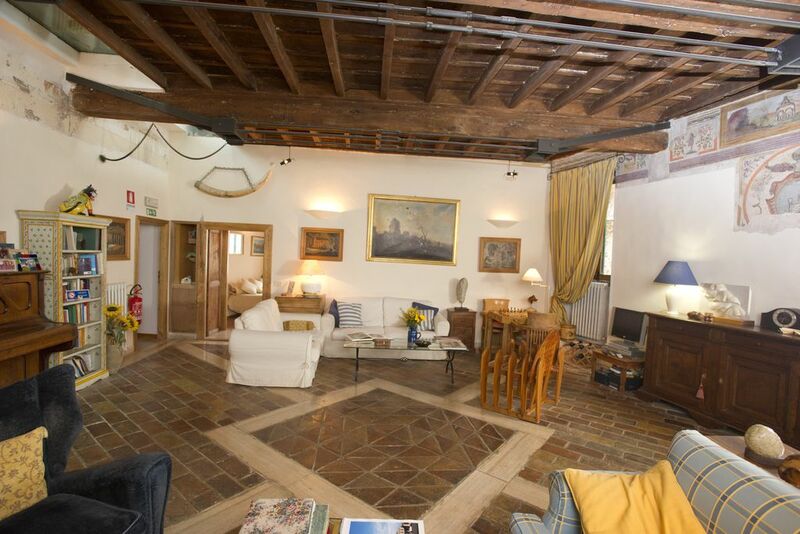 A large, cosy sitting room with beautiful frescoes around the cornicing welcomes you… old stone fireplace, modern sofas, library, paintings, piano. The upper room – opening onto that terrace – is an exposed-beamed contemporary living space with an open kitchen, communal dining table, and views through skylights to church tower and valley. Maureen, warm-hearted and hospitable, is passionate about the region and its interesting itineraries including mapped out hiking trails. She and her daughter Jennifer, arrange cookery courses and will prepare a meal (on request) using the area’s certified virgin olive oil and seasonal, organic, locally-sourced produce. Whitewashed, high-ceilinged bedrooms and lovely suite are charming in their simplicity; travertine bathrooms are a treat. Don’t worry about having to leave your car in the square below the town: with prior arrangements bags can be picked up. Dinner with wine, €30, by arrangement. Restaurant 100m. We had a great stay with dinner at La Torretta. Maureen and Jennifer were wonderful hosts. What a beautiful view of the surrounding countryside! We enjoyed relaxing in this historical home or enjoying breakfast on the terrace. Casperia is a beautiful pedestrian village. In summer months ALMALAMA sporting club, walking distance from Casperia offers a gorgeous open air swiming pool and lovely tennis courts.La Torretta can supply you with a book of local walking trails around Casperia with maps, or maps of mountain hikes.